Morton’s neuroma is a very frequent motivation for consultation and yet the number of operated patients for this pathology is quite low. The forefoot indeed concentrates very different pathologies in a very restricted anatomical area with a very close expression: forefoot pain. Hence, a patient often arrives in consultation with an already established diagnosis of Morton’s neuroma, whereas he is suffering from a disease that has nothing with it. This is all the difficulty of these situations where the surgeon has to develop a considerable energy to convince the patient to start all over again the diagnostic approach. And very often it leads to a different diagnosis. The challenge is important because if a surgery is decided while the Morton’s neuroma was not confirmed, there is a risk of result. The foot sole’s sensitivity in ensured by nerves going from the heel to the toes. When passing between the metatarsal heads, the space in which they evolve is reduced. They undergo a compression, thicken, and take a pseudo-spherical shape called neuroma. This pathology has been known for a very long time and Sir Thomas Morton, British doctor of the XIXth century, gave it his name. He described its most classical presentation: pain located between the 3rd and 4th metatarsal (called 3rd space). The more often, the patients affected are women, in the mid-fifties. Pain can be very intense and acute, and the patient feels forced to remove her shoes, and sometimes to massage her foot in the street. The pressure around the metatarsal heads region in a tight shoe compresses the nerve and increases the symptoms’ intensity. They decrease or disappear bare foot or when resting lying. Tingling in the concerned toes, the most often the 3rd and the 4th, can occur. The recurrence of the pain by palpation in consultation is very evocative of the diagnosis and leads to ask for exams. Formerly, ultrasounds where not adapted for to diagnosis of Morton’s neuroma. It became an reference examination because it allows a dynamic imaging of the foot: the radiologist is able to moove the toes during the exam. The diagnosis is more reliable because the neuroma is better visualised and pain is reproduced by the passage of the ultrasound probe. However, it requires highly specific machine and a radiologist trained to this diagnosis. As for the hallux valgus the choice of shoes is essential. They have to be wide and flexible to limit the compression of the forefoot. The heels are also proscribed because they increase the mechanical strain under the metatarsal heads and thus on the neuroma. Orthopedic insoles may be useful. They have to be custom-made by a podiatrist. Although they cannot spread the metatarsal heads, they aim to discharge the painful area and decompress the neuroma. Finally, cortisone injections are often useful. The liquid is delivered around the the neuroma and at best under ultrasound control. It reduces pain thanks to its anti-inflammatory effect. Unfortunately, the relief is sometimes only temporary because the anatomical cause is still here. As always surgery is decided only after the failure of the non-surgical solutions. Many procedures are described. The most frequent is an excision of the neuroma and a decompression of the corresponding space. 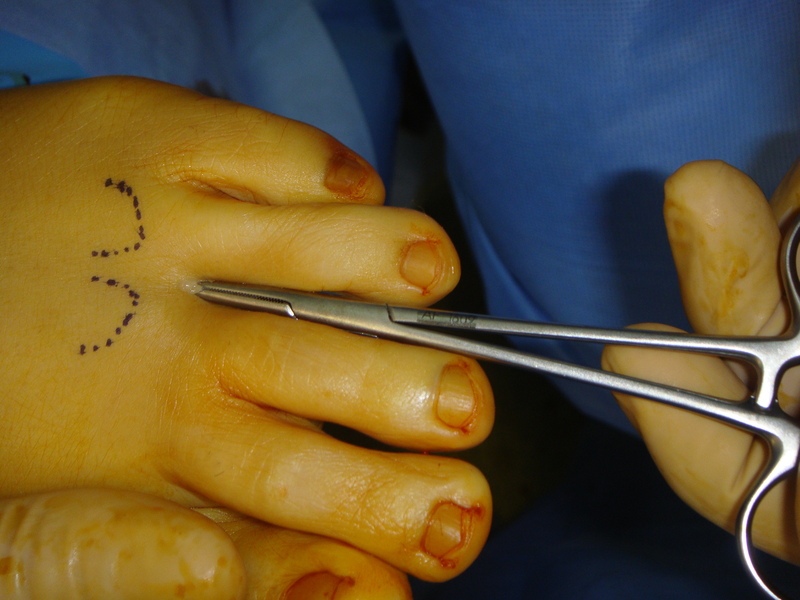 A incision is done at the dorsal part of the foot between the metatarsal heads. After the section of the inter-metatarsal ligament the thickened nerve appears and is removed. When the neuroma is small, it is possible to decompress the nerve without removing it. This surgery can be performed in a percutaneous procedure. Surgery is outpatient, performed under local anaesthesia, and allows to return to a full weight bearing walk immediately after the intervention. Even if it seems simple and quick, it’s associated with risks inherent in any surgical act. In particular, the skin zone at the dorsal aspect of the foot is badly irrigated by the small foot arteries. Therefore, delays in wound healing are not uncommon. To decrease this risk as much as possible, it is capital not to smoke during the week preceding and the two weeks following the intervention. The application of ice is forbidden because it leads to an arterial constriction of the foot, where these arteries are naturally poorly developed. Finally, all the patient history of disrupting the innervation or vascularisation of the foot must be researched before the surgery. The patient is then aware of the risk. For example, it is the case of the diabetes, or history of a chemotherapy, even administered a long time ago. 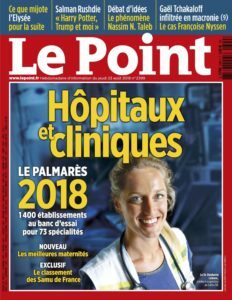 Finally, the results are often very good if the surgeon makes sure, before surgery, of the concordance between the foot’s clinical exam and imaging.